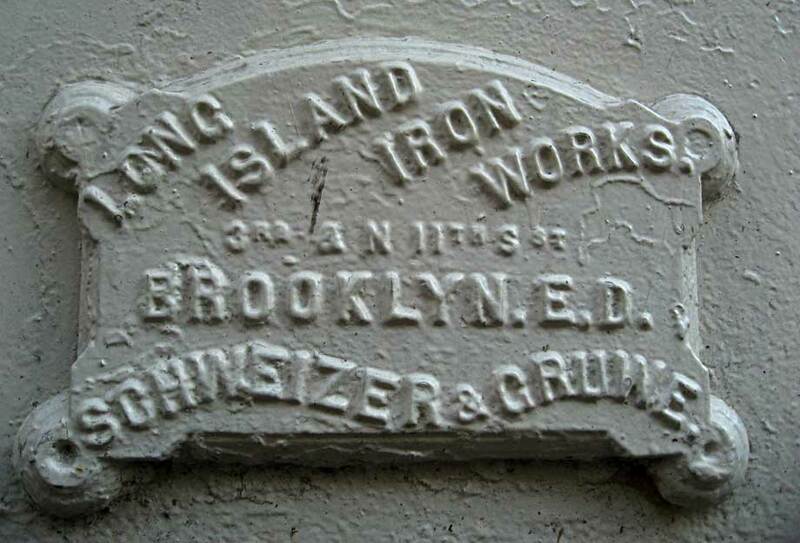 This label is affixed to the cast-iron facade of 452 Broadway. An illustration of this building is found in Cast-Iron Architecture in New York; a Photographic Survey by Margot Gayle and Edmund V. Gillon, Jr. (1974). Gayle's description (p. 136) tells us, "In 1876 two New York engineers, August Schweizer and Emile Gruwe, built the light, open, lacy iron fronts shown in our pictures." Some of the lacy quality of 452 Broadway can be seen in this photo of the 2nd story. Emile Gruwe (often the French form, Gruwé, was used) was an architect. He appears to have been born in Dunkerque, France (région Nord) on the border of Belgium. He seems to have lived a great deal of his life in Hoboken, New Jersey, but was recorded in the U. S. Census of 1880 living on Willis Avenue in the Bronx, New York City. The census recorded his place of birth as Belgium, and he lived with this wife, Henrietta, and three children of the time, Adeline 12, Charles 10 and Louise 7. There is some evidence that this was not an entirely happy marriage. The couple were married in Manhattan 2 June 1866. Henrietta was Henrietta Giller, born Germany. Twelve years later the New York Times (7 Dec. 1878, p. 5) reported that Mrs. Henrietta Gruwe, wife of Emile Gruwe, architect, had asked for protection from her husband who wanted her confined to a lunatic asylum. A succession of entries in Gospill's Jersey City, New Jersey, city directory sometimes indicated that Henrietta lived on her own. and at other times the entry was under the name of Emile. In 1887 Henrietta Gruwe appeared as the widow of Emile Gruwe. In 1889 Emile Gruwe was listed as living at the same address. The last such entry for Emile Gruwe was in 1891. The death of an Emile Gruwe was reported in a New York City Death Register on 22 Nov. 1888, but this was a child, aged 2 days, possibly a son of the architect. Emile Gruwe designed the Evelyn Apartments, 101 W. 78th St. (northwest corner of Columbus Ave.), 1882-1886. The AIA Guide to New York City, by Norval White & Elliot Willensky (4th edition, 2000) calls it, "A big, bold symphony in reds: brick with all kinds of wondrous unglazed terra-cotta flourishes." (One of the unglazed terra-cotta flourishes is seen here.) Christopher Gray devoted a Streetscapes article to the Evelyn Apartments, New York Times, 1 Nov. 2009, p. RE5. The Guide to New York City Landmarks (4th edition, 2009) mentions Emile Gruwé as possibly assisting in the design of the 18th Police Precinct Station House and Stable (1890-1892) in the Sunset Park area of Brooklyn (4th Ave. at 43rd St.). Christopher Grey's Streetscapes article (New York Times, 26 July 1987) on the 18th Precinct Station House says, "It was designed by Emile Gruwe, who produced an unusual castlelike building, fundamentally Romanesque in styling but also drawing from other styles." Robert A. M. Stern, et. al., in New York 1880: Architecture and Urbanism in the Gilded Age (1999) devote a paragraph to "Emile Gruwé's Florence (1878), at the northeast corner of Fourth Avenue and Eighteenth Street." This building was an "apartment house that may well have functioned better as a hotel." The 1880 United States Census recorded A. Schweizer & Co. as owning $115,000 of real capital and $45,000 of raw materials. It employed 60 men at annual total wages of $33,600, and that year it produced an output worth $100,000.